SAIVE (smart artificial intelligent vehicle ecosystem) is a near-future concept where vehicles and commuters communicate with each other while automatically recording and broadcasting data. We primarily focused on cyclists as, based on our research, we deemed them to be the most vulnerable on the road. However, pedestrians and all types of motorists would benefit from this system and we looked to improve the on-road experience for these users as well. I worked with Ananda Annisa Prasetyanto and Qiao Yin, two CMU MIIPS students, on this project. Special thanks to Carly Burton at Cognizant. If SAIVE predicts that a car’s near-future trajectory will impact a nearby person, their turn signal will automatically flash, even if the driver hasn't turned on their blinker. The key is that false positive turn signals have minimal consequences. "Dooring" is when the opened door of a parked car collides with a biker. If SAIVE predicts this will happen, a notification will be projected onto the car window and the door will be temporarily locked. A "halo'd" object is similar to a smart object, constantly producing data about it's environment. In response to passionate interviews, we intentionally chose to halo the smart phones of cyclists instead of the bikes themselves. Location and velocity data can be captured by a smart phone in the pocket or backpack of a cyclist. Drivers already have the potential to be predictable through normal driving activity. The speed of the car, angle of the steering wheel, weight on the seat cushion, and many other variables can already be analyzed. DSRC, "dedicated short range communication", is similar to bluetooth technology and is the backbone of SAIVE. The implementation of DSRC within the ecosystem requires a vast degree of edge computing which isn't possible with today's technology. As this was a future concept, we didn’t see a problem with this constraint. 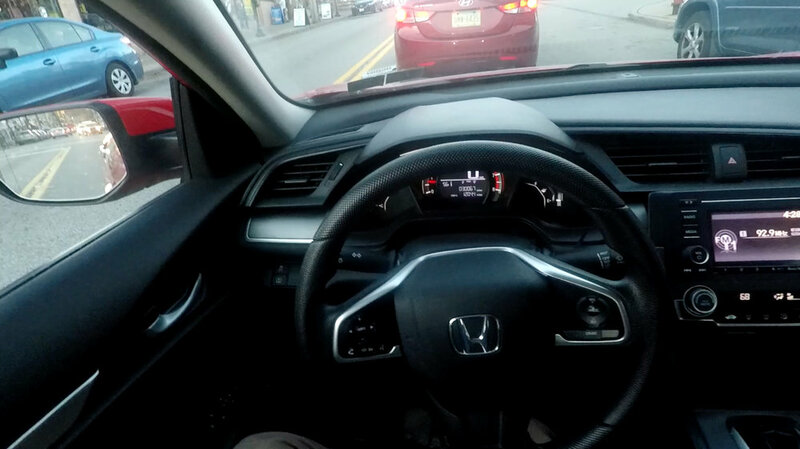 Autonomous vehicles and smart traffic signals, both which have been selectively implemented in Pittsburgh, collect vast amounts of data, adding a wealth of information to SAIVE. Our team conducted interviews with commuters (cyclists, motorists, and pedestrians) as well as experts in cycling and traffic flow in order to gain insights on the current transportation system. Cyclists are primarily subordinate actors on the road and on the sidewalk, so we decided to focus our effort on improving their experience. We asked commuters to walk us through their daily commute with Google Maps, as contextual inquiry about the challenges they face on the road may have proven dangerous. 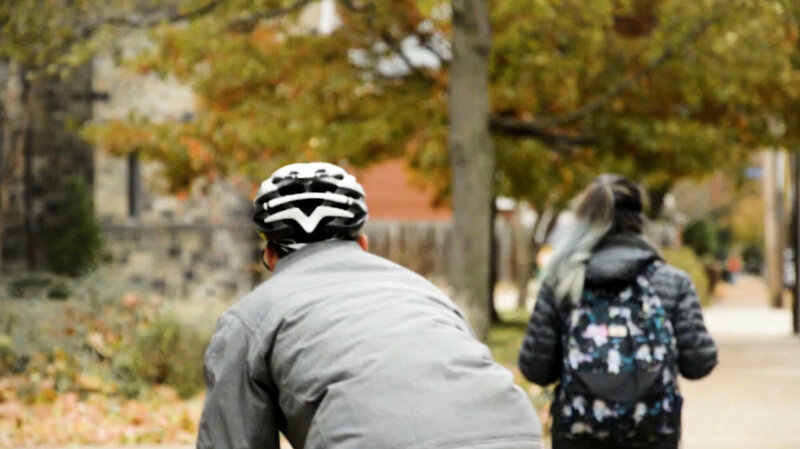 We decided to spend time observing the interactions between bikers, pedestrians, and motorists in order to see if the relationships between the groups were truly as described. Mapping a cyclist's full experience from start to end, while seeming unnecessary at times, helped ensure that we would be maximizing our impact for urban cyclists. After identifying our problem space, we decided to check back with our project brief, which was to implement AI into a transportation system. We decided to focus on a relatively near-future concept, that of “alerts” and “bike visibility”. We moved forward with an abbreviated design sprint in order to generate numerous ideas and figure out the key interactions we wanted to support between cyclists and other actors on the road. After deciding on a large number of interactions we wanted to support, selecting only a few to illustrate with our concept video was the final step. Choosing interactions which were easy to demonstrate while having a large impact was our sweet spot. Our next step would’ve been more in-depth testing for the various interactions we planned for. Creating a safe way of testing these concepts in the real world with cyclists and motorists would’ve been an interesting challenge.